The electro - mechanical energy conversion is done through medium of magnetic field. It is assumed that there is no loss of energy in the magnetic field. 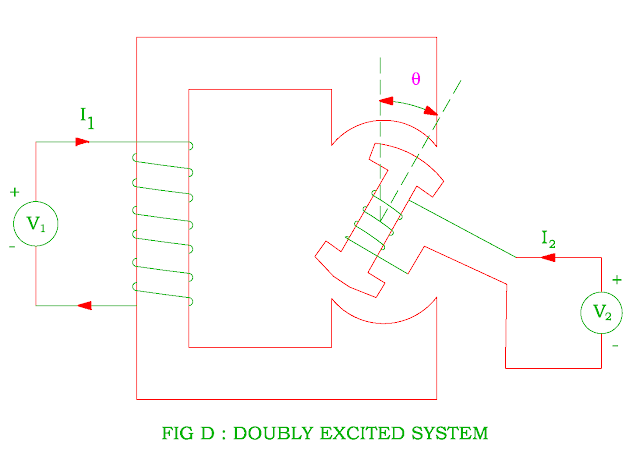 There are two types of the excitation systems. As its name "Singly" suggests that there is only a coil is required to produce the magnetic field. There is one set of electrical input terminal and one set of mechanical output terminal in this excitation system. 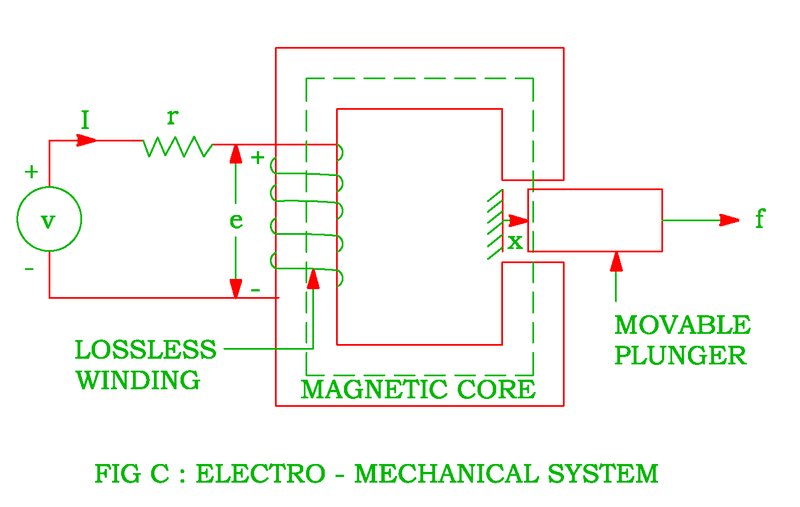 The electro – magnetic relay, solenoid coil, hysteresis motor etc are the examples of singly excited system. Figure A shows a force producing device in which single coil acts as an input terminal and a movable plunger serves as an output terminal. The electrical input has two variable : e ( volts ) and I (current ) whereas the mechanical output has two variables : f ( force ) and x ( distance ). It should be noted that equation (6) is used to calculate force and torque in electro mechanical system. As its name "Doubly" suggests that two coils are required to produce mechanical output force. There are two sets of electrical input terminals and one set of mechanical output terminal in this system. The synchronous motor, alternators, dc machines etc. 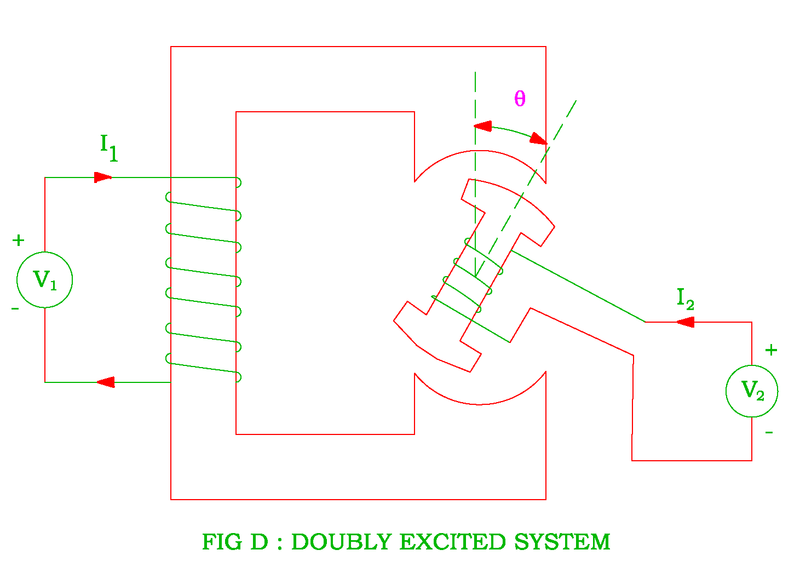 are the examples of doubly excited system. Figure D shows an example of doubly excited field system. There are two windings in the rotating systems. One winding is wound on the stator and the other on the rotor. The stator and rotor windings are connected to electrical sources V1 and V2 respectively. The motor can allow rotating between two poles. The magnetic field depends upon the current I1 and I2 and θ between stator and rotor. (2) The torque is directly proportional to the two electrical signals. (3) The mechanical energy conversion does not depend upon change in current.